Brian Freskos filed this request with the Manatee County Sheriff's Office of Manatee County, FL. Have forwarded your request to our records department….will let you know a cost estimate. Wanted to let you know the cost estimate may take 1-2 weeks. The Manatee County Sheriff’s Office is in receipt of your April 4, 2017 Public Records request regarding the use of stolen firearms in crimes. It has been determined that the nature or volume of public records to be inspected or copied requires the extensive use of information technology resources or extensive clerical or supervisory assistance, or both. Pursuant to §119.07(4)(d), Florida Statutes, in addition to the actual cost of duplication the Manatee County Sheriff’s Office may collect a reasonable service charge based on the cost actually incurred by the Sheriff’s Office for such extensive use of information technology resources or personnel. Your request is extremely broad and detailed, such that it is difficult to predict costs. For purposes of the estimate, I am estimating 10 minutes per report. There are at least 3400 reports that may be responsive records, and some of them will take significantly longer than 10 minutes to review and redact. At this time, the Sheriff’s Office’s conservative cost estimate is $8100.00. I anticipate, however, that actual costs will be in excess of the cost estimate. The estimated reasonable service charge associated with your request is $8100. Please advise as to whether you intend to pay the identified amount and, if so, forward a certified check, business check or money order in that amount to my attention. Credit Card payment is permitted only when the customer appears in the Sheriff’s Office Records Unit to swipe the card. If you would like to submit payment via mail please direct it to my attention. Upon receipt of full payment, the Sheriff’s Office will proceed with your request. Please note that if we have not received full payment by May 22, 2017, your request will be closed. This e-mail address may not be monitored. Submission of a public records request to this email address could result in a delay. It is recommended that you submit your request in person, by mail, or by calling Records at (941) 747-3011, ext. 2295. For more information, please visit our website at http://www.manateesheriff.com/Public/RecordsDepartment. We will not be able to pay $8100 for this request. However, maybe there is a way to narrow it or figure out another way of getting the information we seek. Do you have a few minutes for a phone call? As per our conversation on Monday, April 24th, attached please find our Property and Evidence Unit’s current inventory of firearms, a list of firearms from our Records Management System, and three Inventory Asset Disposition forms for agency firearms lost or stolen during the timeframe you specified. I have also included a list of our status codes that will correlate with the “prstatus” column in attachment 010110 thru 042717.xls. Also, in reference to that attachment, there were 157 items removed from the list because they were not linked to a case number and we believe they are already reflected in the records provided. Because there was very little review or redaction necessary for the records provided, there is no charge for this request. Should you have any questions, please do not hesitate to contact us. Additionally, the date on the list from our Records Management System reflects the date it was entered into the system; which is not necessarily the date that it was stolen, recovered, seized, etc. Thank you so much! and please pass along my thanks if anyone else also assisted. I don't see the list of Pr status codes? Sorry about that. Here it is. You can ignore the highlights. They were there for another purpose and I just reused this to save time. If you have any questions, please let me know. 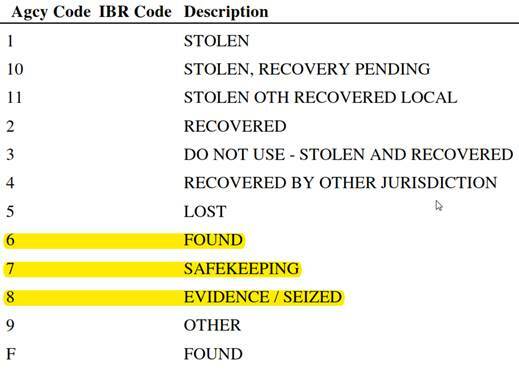 For the PR Codes, does "Recovered" and "Recovered by another agency" mean that the gun was previously reported stolen? Good morning Brian. It should mean that, yes. However, if you don’t have a previous stolen entry for it for the Recovered ones, that may not be the case.